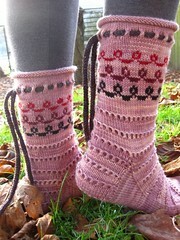 Keep On Knitting In The Free World: Socks For All Seasons e-book! It all started long ago as a pattern club. Once a month for an entire year, members received a link to download the patterns that are now compiled into this collection. The patterns are now available for individual purchase or as one mega-collection - this here e-book. -Clickable Table of Contents allows you to jump to the Legend or any other place in the ebook easily. The e-book is now available at an introductory rate of $15.99 for three months. On December 19th, 2011, the price will go up to $24.99. What's this about a giveaway? I will give away three free e-books to folks who leave a comment here on the blog. Just comment below and let the random number generator do the rest. Winners will be announced in one week - Monday, September 26th. Help me spread the word! Thank you to the club members, testers, editors, collaborators, friends, and family from the bottom of my heart. This has been an amazing year full of challenge and wonder... I am so lucky to have shared it with you! All of the socks look so beautiful. 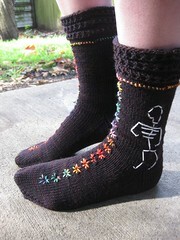 I especially like the Day of the Dead socks. Good luck with your book. The socks look wonderful. I am enchanted with the pinata pattern. 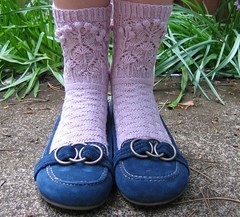 I love those button-cabled-cuff socks! Adorable! Wow these patterns are beautiful! I'm sorry I didn't know about the club before now. Looking forward to see what the next club is all about. wowzas! so much beautiful work all in one place! You did it! Congrats on the release of the e-book! Looks beautiful! You are incredibly creative, your patterns rock! 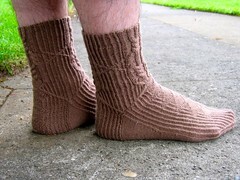 I am the proud owner of your patterns via the sock club, and I must say, whoever wins your give-away, will be very happy. Congratulations! That's a great accomplishment. Thanks also for sponsoring the giveaway! These are all so cool! I love the way you play with cuffs especially. I love your patterns. Even through I wasn't knitting along (I've got a serious sock commitment problem), I'll admit to being excited every month to see what kind of awesomeness you'd come up with. Congrats Star! Wow, what an accomplishment!! 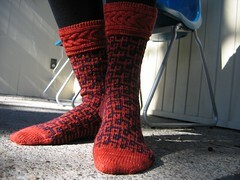 I love those sock patterns! Really cute socks. I'm especially drawn to the drawstring one. Yeah! I've been waiting for this release!! 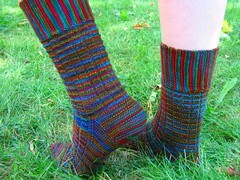 Love the socks with the multi-color, multi-directional stripes. Makes me want to start knitting them right this minute! I'm a Day of the Dead fan, too. The socks would go with my complete outfit. 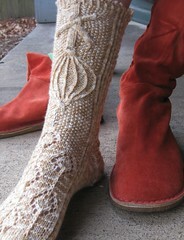 I liked your wild skeins class at Sock Summit '11. 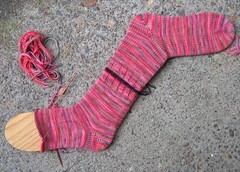 I just started a pair of STR Hard Rock socks using the Banisters textured pattern from the wrist warmers in a Knitting Traditions magazine. 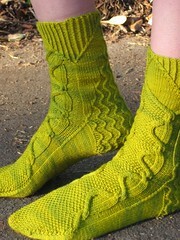 I'm working on my Transition Point socks and loving them! Congrats on your new book! Awesome patterns. Can't wait to knit some up. If I don't win I plan on buying the book anyway. Love the patterns!